Having fallen behind to Abdoulaye Doucoure's 54th minute own goal, Watford responded impressively, recovering to claim the points through headers from Troy Deeney and Craig Cathcart. It remains to be seen how long Javi Gracia's third-placed side can remain among the upper echelon, but this win confirmed they are currently there on merit. Having beaten Brighton, Burnley and Crystal Palace in their opening three games, this was Watford's first test against a top six side. But Watford rose to the challenge to secure a first league win against Tottenham since 1987 -- underlining their status as the league's surprise package. Defeat, though, highlighted Tottenham's lack of cutting edge, with Lucas Moura the only player to consistently threaten, while the manner in which they conceded was cause for concern. Initially, though, Spurs' problems appeared to lie further up the pitch during a laboured first half -- not that Watford displayed much attacking threat of their own in the first half. There was a much greater sense of urgency after the break -- initially from Tottenham -- with Moura and Christian Eriksen at the forefront of Tottenham's improved efforts. Christian Kasabele's poor clearing header allowed Moura the opportunity to collect the ball on the right hand side of the box and drill in a cross that deflected off the backtracking Doucoure and past keeper Ben Foster. At that point there seemed little chance that Watford's dismal record against Spurs was about to change. Gracia's side, though, have already demonstrated commendable resilience this season and the way they responded confirmed their growing stature. For the first time in the game they applied sustained pressure and were unfortunate not to equalise when Spurs defender Toby Alderweireld headed Deeney's cross against bar and post. 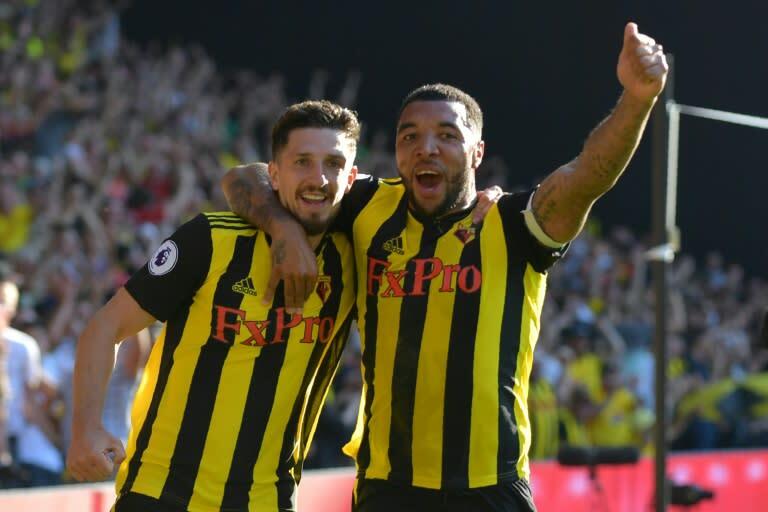 Spurs were rattled and confirmation the balance of the game had shifted came in the 69th minute when Deeney headed home from Jose Holebas' free-kick. Then seven minutes later, Pochettino's side were unable to deal with another set-piece when Cathcart met Will Hughes' corner to head past Vorm.